This interview is a bit late, an email that got lost, but here it finally is. My interview with G.J.Koch. There is also a contest open to all. So read and enter. 1. Hello there, G.J.Koch J Could you tell me a bit about yourself (and all you’re alter egos). I write science fiction. Not the hard stuff, though. Because that requires actual scientific knowledge or at least actual scientific research. Knowledge may be power and research may be cool, but they take time away from writing jokes, action, and romance, and being witty in the face of death is what it’s really all about. Alter egos include the lovely and amazing Gini Koch, the kind and talented Anita Ensal, the dark and dreamy Jemma Chase, the quirky scaredy-cat J.C. Koch, and the tough but fair A.E. Stanton. 2. 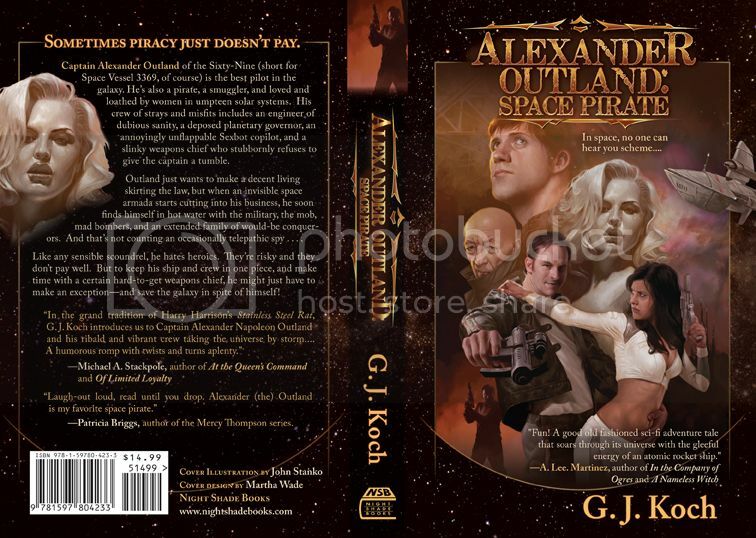 Your new book is called Alexander Outland: Space Pirate. What is it about? 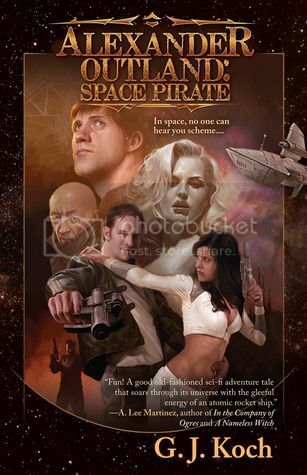 Trouble’s brewing out in space, and Alexander Outland -- the least likely hero in the galaxy -- and his eccentric crew have to save the day, despite the fact they’d prefer to take the money and run. Alexander Napoleon Outland is the best pilot, and ladies’ man, in the galaxy. But Nap, as his friends call him, is more than that -- he’s a schemer with a heart of gold he desperately wants to hide, a soft spot for other people’s cargo and his exotic weapon’s chief, and the unerring ability to find the biggest misfit on any planet or space station and somehow join that person onto his crew. Nap’s not your classic hero, but that tends to make him the right guy for the job…whatever the job happens to be. 3. Where did you get the inspiration for this book? I actually got the inspiration for this series from a name I randomly stumbled across. I saw it and said, “Wow, that would be a GREAT name for a space pirate! A mega-cool space pirate. I wonder what kind of galaxy he lives in.” The rest, as they say, is history. Okay, okay, honesty forces me to admit that two different songs also helped in the initial formation of the idea. “Space Boy” by Splender and “Space Cowboy” by, God help me, *NSYNC. 4. And now to Captain Alexander. Who would play him in a movie and why? 5. He has quite the crew. But who is your favorite among them? Oh. Gosh. That’s like asking me which kid is my favorite. (Ha! The chicklet! I only have one, so that makes it easy.) But, since I have faves among my pets, I know I can admit who I favor most in Nap’s crew. LOL, okay, well, I like the Governor because it’s fun to have the cranky, knowing oldster along. I like Audrey because she gets away with so much because, well, she can. Slinkie, of course, because beauty and brains with attitude is always fun to write. Randolph is a great straight man who gets to make the zingers once in a while. And I have to admit, I love the villains, too. A lot. I have a very soft spot for Tanner because of all he’s been through. And Lionside surprised me constantly throughout the book. And Hulky, what a hero. And when you get right down to it, Jabbob and Ol’ Temper really have an edge, just because they crack me up. So, yeah, I love all the characters, basically. But, honesty compels me to admit the truth. Nap’s my favorite. It’s true, I do love the Outland. 6. What’s up next from G.J.Koch? 7. I do think I want to round this off with something silly. What would Alexander say to Katherine “Kitty” Katt if these two met? Just enter or just comment, ask a question, anything your heart desire really. You can reach G.J. Koch at Space…the Funny Frontier (http://www.ginikoch.com/GJKbookstore.htm). Oh dear. Dr Spock, a case for you! I won't win, I know it, but of course I can enter. Who is to say I cannot? Entering. You SO had me at that joke. I just know now that I will love it. ;) Oh and to have pics of NAP in my head? YUM! I love sci-fi and handsome pirates. Yes, I do think I need this book! Yes, I'm entering! Thank you for the interview Gini. Funny interview and the synopsis and cover have me intrigued..Thanks! Great interview. And I do love a handsome, funny hero. 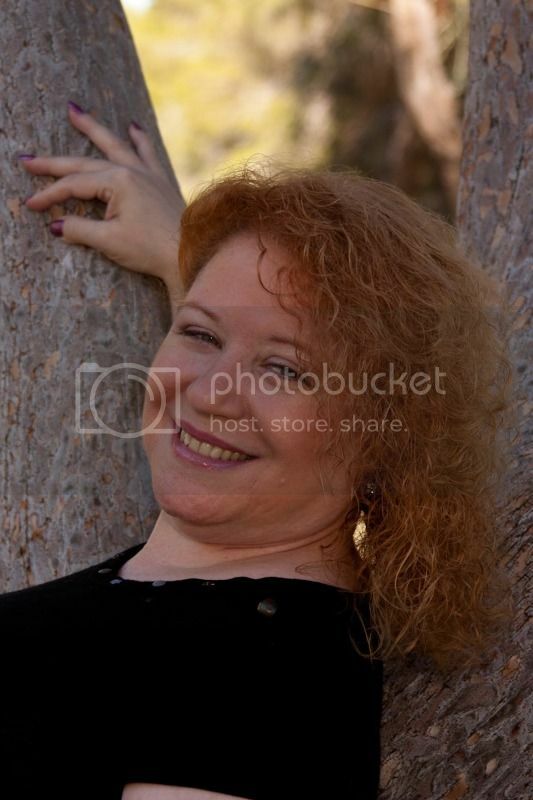 "Oh it's about 360 pages long." Clever....A space pirate that is a new one for me. I am on board especially if he is hot! Thanks for the giveaway! This sounds really good and a great interview. I'd love to enter to win an ecopy. Awesome contest!! I'd love to enter to win! Thank you! Love this line -- kind of sounds like a young Rocky Balboa! If you are secretly a multi-polar personality then you have found the perfect occupation! So many different facets of yourself. Really fun interview & now I'm interested in reading this series. I think I need to meet Nap. I love Gini Koch's writing & this sounds delish! Would love to win this! Oh, and there' no shame in NSync's "Space Cowboy" being a partial inspiration. That song was the jam back in the late nineties!!!! Fabulous interview. Thanks for sharing! Oh yes the good old days, though I was more a BSB fan, what was I thinking..
Great interview! No need to enter me though. Oh I already have a copy, so not entering. But Wonderful interview, both of you. :) I do hope Night Shade goes with the next book. :) Looking forward to hearing the good news. Fun interview. Book looks like a lot of fun. Gini, I'm chalashing for a copy of this book. You know I love the Kitty Series, so now I need to work on Alexander.. It looks like a real NYTimes list winner. So Nap is Michael Gowers galactic twin? Great interview! Book looks and sounds amazing! Thank you for the giveaway. The book looks pretty awesome. Can't wait to read it.